"The things we are developing are completely unique and set us apart from the competition," says Baldwin. "No one else in the marketplace has what we have." Back in 2013, Entrepreneur wrote that the fro-yo industry was nearing its saturation point. Soon after, places that were initially swept up in the frozen yogurt craze, like New York City, began losing locations at a rapid rate. Frozen yogurt franchises are cheap to buy but with limited winter appeal and a minimal morning market, it can be difficult for sometimes ill-prepared franchisees to keep open. Plus, like the cupcake bubble that definitively burst when Crumbs declared bankruptcy in 2014, there can be issues differentiating between chains selling similar products. That's where Baldwin comes in. Since 2007, the same year Menchie's was founded, Baldwin been maintaining the menu for the company, closely tracking food trends and customer demand. 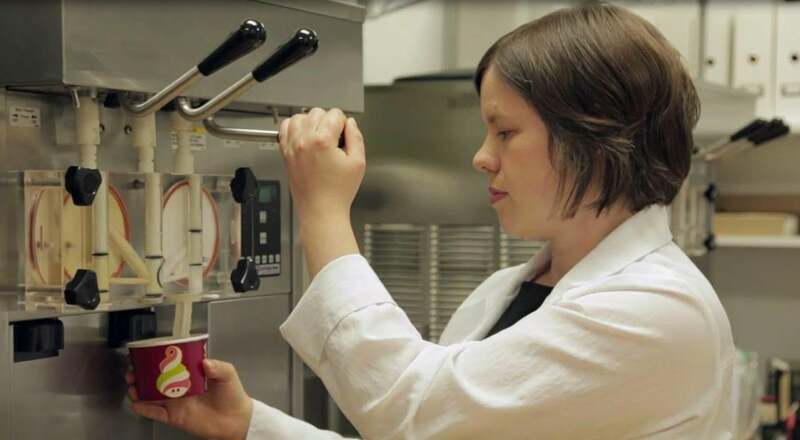 With experience as a food and beverage production manager at PepsiCo, Baldwin oversees the process of frozen yogurt creation from discovering new flavors to releasing them into Menchie's nearly 400 locations. "We're going from one gallon we make by hand, right here at our global headquarters," says Baldwin. "That gallon has to translate to 400 gallons in mass production." Each year, her team aims to create 24 new flavors, from frozen hot chocolate to a recent Nutella-based invention (nut butters, according to Baldwin, are very in right now). One of Menchie's major focuses has been partnering with famous food companies to create flavors no other fro-yo chains offer. For example, Menchie's partnered with Oreo to create two flavors that deconstructed the Oreo cookie – one "just the crème" and one "just the cookie." Other Menchie's mashups include Cinnabon and Reese's Peanut Butter Cups. Another trend: the increasing demands of health-conscious fro-yo customers, as it is no longer enough for frozen yogurt to simply have less calories than ice cream. "I think that people are really focused on health, more than ever," says Baldwin. "You see that people may be following gluten-free diets, even though they don't have celiac disease. You see that people are looking for a lower calorie diet. You see that they're looking for probiotics… We are really able to deliver a lot of those things." Menchie's is also looking to expand beyond frozen yogurt. Similar to the revamped Crumb's diversification effort (though on a lesser scale), Menchie's has launched a number of frozen yogurt cakes. Plus, Menchie's CEO Amit Y. Kleinberger is now developing a new pizza concept, to be operated separate from existing Menchie's locations. Baldwin isn't overseeing the pizza concept, but she is set on constantly evolving Menchie's menu. "I would say you have to think outside the box," she says. "[Menchie's is] kind of opening up and branching out… We're excited to keep our eyes open and expand ever more into [new] facets of the food industry."